Qantas Group CEO Alan Joyce and Queensland Premier Campbell Newman at the announcement to launch Brisbane-Tokyo flights. Qantas is set to begin new four times weekly services between Brisbane and Tokyo Narita from August 1 2015, and has announced it will shift its daily Sydney-Tokyo flights from Narita to Haneda from July 31 2015. And a further three times weekly service to Narita, operating on alternate days to the Brisbane flights, will operate from another Australian port, Qantas says, details of which “will be finalised shortly”. The new Narita services from Brisbane and the second Australian city will be operated by Airbus A330s, while the Sydney-Haneda flights will utilise Boeing 747-400s. Qantas says better aircraft utilisation is providing the capacity to enable the new Tokyo flights. The new services mean Qantas will offer double-daily flights to Tokyo. Brisbane-Narita flights will depart at 1115 and arrive at 1930, with the return flight departing 2055 and landing back in Brisbane at 0555. Sydney-Haneda flights will depart at 2040, arriving at 0530 the following morning. Return flights to Sydney depart at 2200, landing at 0830 the next day. Meanwhile, discussions are ongoing with a number of airports for the three times weekly Narita services, according to Qantas Group CEO Alan Joyce. “We’re in dialogue with a number of airports and what we’re very keen on doing is making sure we get the right arrangements, incentive deals from the airports in question and there is a lot of competition to try and get those services,” Joyce told media in Brisbane on Tuesday. Qantas late last month announced it had secured slots to Haneda, the Japanese capital’s second airport which predominantly serves domestic flights and is significantly closer to central Tokyo than Narita. “We’d been applying for some time just seeing what we could get and we’ve been very persistent on it,” Joyce explained of the Haneda slots. “I think partly this is [the result of] the relationship we’ve developed with the Japanese in setting up Jetstar Japan and the Free Trade Agreement opening up with the opportunities that that creates. 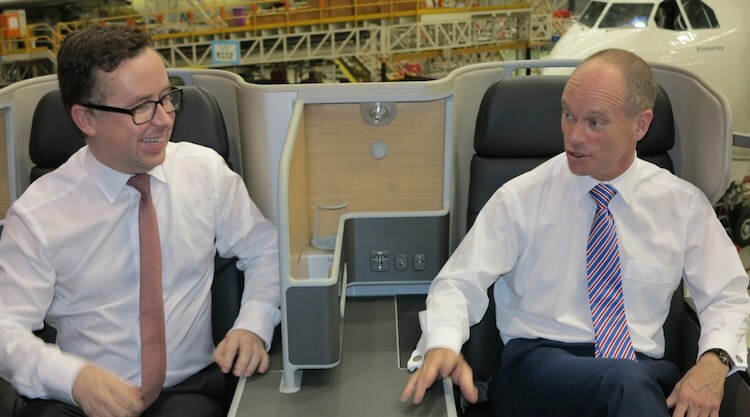 The new services were announced at Qantas’s Brisbane heavy maintenance centre, where Joyce and Queensland Premier Campbell Newman viewed the first A330s being upgraded with the airline’s new business class and upgraded economy class product. Qantas is upgrading 28 A330-200s and -300s with new lie-flat business class seats, new inflight entertainment systems and refreshed economy class seats. The first upgraded aircraft – A330-200 VH-EBV – is due to enter service later this month flying domestically between Sydney and Perth. International services with the first reconfigured A330-300 – VH-QPA – will begin in mid-January between Melbourne and Singapore. 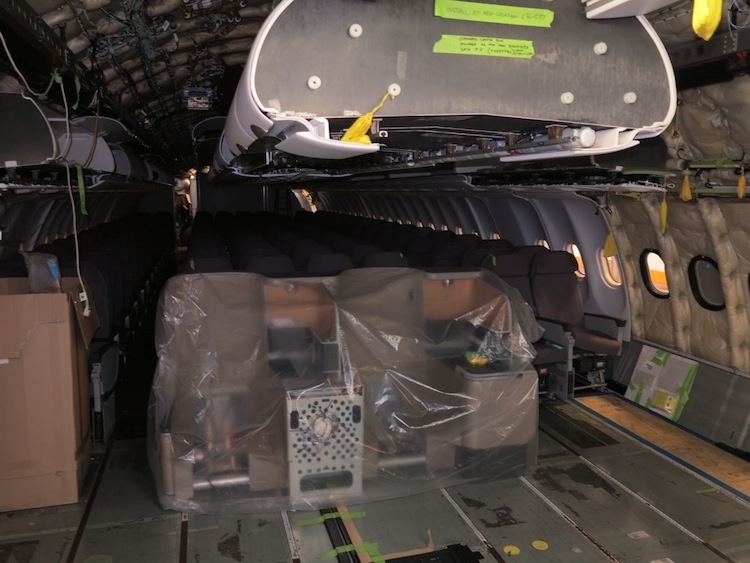 The upgrade work, which takes 30 days per aircraft and involves the installation of 250,000 individual parts, is due to be completed by the end of 2016, Qantas says. More than half the fleet is expected to be upgraded by the end of 2015. 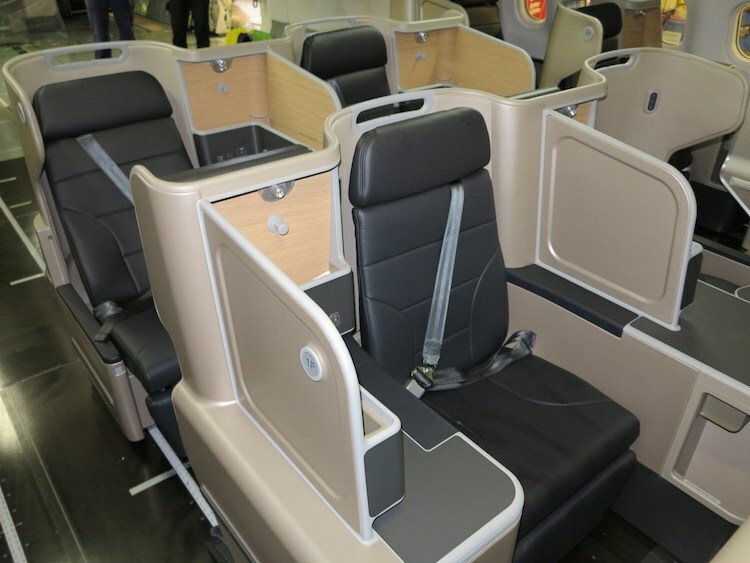 New business class seats installed in A330-200 VH-EBV. A330-200 VH-EBV should return to the fleet at the end of December as the first A330 fitted with the new interior. So they’ve decided to keep the 747 on the ground in Tokyo for 17 hours, not sure that’s great fleet utilisation. Are the benefits that high for two evening departures to require a whole second aircraft to operate this service? Or does Qantas actually save money by not flying their 747s?! It is already the case that a 747 sits on the ground at Narita for most of the day. The Sydney-Haneda flight schedule mirrors/replaces the existing Sydney-Narita schedule. There are an awful lot of aviation enthusiasts/travelers in Japan who would absolutely rejoice to see a beautiful Qantas 747 Jumbo at Tokyo-Haneda every day. By all means, the 747 is the right choice of aircraft for this critical route between HND (TYO) and SYD, though the new 747-8 would be even more suitable for its significantly improved Boeing 777-class fuel economy, not to mention its increased payload-range capabilities (even though the latter capability is not relevant to the Japanese route). perhaps when the Qantas 747-400 meets the Lufthansa 747-8 Intercontinental at Haneda next year, that is when the airline would seriously consider replacing its legacy 747-400/ERs with the game-changing Dash 8. As for the down time at Narita or Haneda, it should rather be regarded as a good advertising opportunity for Qantas. Large airliners used for long haul international routes would have to ensure extended parking hours somewhere in the world due to schedule limitations whether its a home port or an outstation. Too tight a network schedule for aircraft utilisation is risky, as it would just make recoveries from irregularities much more difficult to manage. Thrilled to see your flagship 747s continually thrive, and remember there is always Dash 8 for an option, which surely would only help contribute to your success and more importantly pride as the wings of Australia! Good on ya, Qantas! Love the car seatbelt on the business class seats!! Please don’t ever run an airline. Your emotions and ill judgment of investment will destroy the airline faster than the Concorde. The b747-8 is hardly a game changer and it is struggling for sales and would be a waste of equipment for QF who have selected the more fuel efficient and more economic A380 as the intended replacement. QF have until now not displayed a single speck of interest and with the airline consolidating it is highly unlikely it will ever consider the dash 8.